Sometimes you just need to play a few rounds of mini golf to relax and remember why you came to North Myrtle Beach. Putt putt golf is great for couple, families, and even groups of friends. It’s fun, affordable, and it even allows you to get a little competitive. There are several mini golf courses in North Myrtle Beach, here are five of them. Lost Treasure Golf is an easy course, but it’s still a lot of fun. One of the neatest aspects of this course is that you take a small train to the top of the course and then work your way downplaying as you go. Before you start you can choose which route you want to take and there are plenty of plants, waterfalls, booby traps, caves, and more along the way. This is one of my kids’ favorite places to golf. Who doesn’t like dinosaurs? Dinosaur Adventure Golf is a unique golf course where can play around giant prehistoric giants. Some of them are friendly and some of them are ferocious. This is a great course for kids, but adults will enjoy the challenging holes just as much. My kids are dinosaur lovers so we half golfed here several times and it’s always a great experience. This course allows you to play both inside and outside. There are plenty of shady spots and lots of plants and wildlife. You may see live turtles and even exotic birds. It also just happens to be an active volcano so if you aren’t careful you might be caught inside when it blows. The special effects are great and the course has a lot of nice decorations. 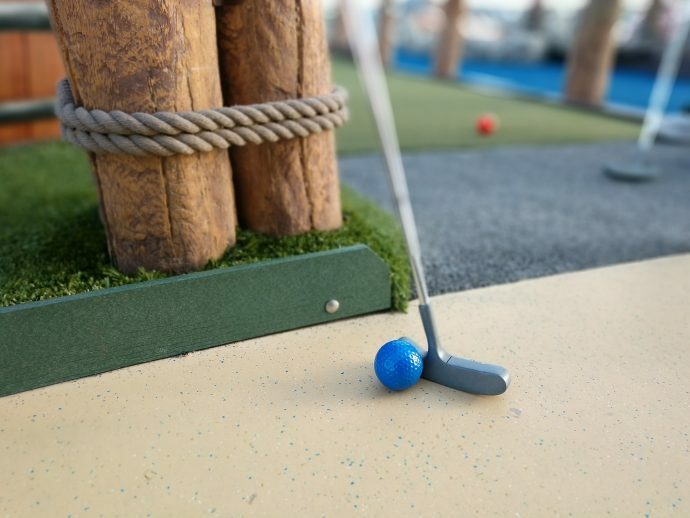 There are two courses to choose from at Mutiny Bay Miniature Golf and plenty of fun to be had. You can enjoy a live pirate show every few minutes and you never know what you will run into at each hole. Its an affordable course and there’s a lot of interesting décor to enjoy while you are golfing or waiting for your turn to putt. Molten Mountain is another active volcano that erupts at random. When you are golfing there, you better watch out for lava! There are a lot of challenging holes and the course is beautiful. There are plenty of waterfalls, caves, caverns, and live plants growing in and around the volcano. They offer group pricing and are in a convenient location.